Ok laura, I’ve got some good news and some bad news for you. The good news is, you are getting interest. The bad news is, if you don’t know how to turn that interest into paying business, all that interest is for nothing. IF you don’t know how to close the sale and get paid, then you don’t have a business, you’ve got a hobby. But closing the sale is actually very simple when you know how to do it without feeling pushy. 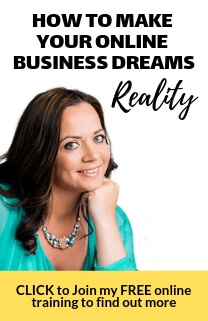 Part of this is about getting your mindset right and part of this is about having the right words to close the sale naturally and conversationally. Closing techniques are not necessary to close sales unless, of course, you are into high-pressure selling (and if you are, this online tv channel is not for you cos that’s not how we roll around here). So let’s talk about the mindset piece first. You’ve got to remember, that if you’ve got this far, the other person IS interested, they’ve signed up for your free stuff because they are interested in what you offer. The next thing to remember is that people may hate to be sold, but they love to buy. So think of your role in this as ‘helping them to make the buying decision’. The word ‘to sell’ comes from a finnish word meaning ‘to serve’. If you’re NOT inviting people to take the next step and invest in your paying services, you are actually doing them a disservice. So have a sales conversation which naturally leads to your prospect wanting to do business with you. You want to ask questions which will help you establish the gap between where they are and where they want to be, and then present your solution as the way to close that gap. As long as you do this, the only “closing” you have to do is to suggest the next step. Here are my favourite conversational ways to suggest the next step. Do you have further questions, or are we ready to proceed? Is there anything else you need to know to move ahead with this order? Any reason to wait any longer? Are you ready to start going over the final details? Am I about to get my next client? So here’s what to do now. Pick two of the examples I just gave you and practice them until they feel natural and conversational. Make sure to write them down and then USE them in your next sales conversation. You’ll start getting paying clients faster than you ever dreamed possible. And finally who do YOU know who needs to see this episode with them. Please share it with them right now, they will thank you for it and you’ll collect bonus ‘good karma’ points too! That’s it from me, and I look forward to seeing you on the next episodes of bernadettetv! Thanks for this Bernadette! While I already practice many of these points, I will be practicing 4 & 5 more. I find often there is a waiting game involved with some of my clients and I am always afraid of getting too pushy and scaring them off. During my quieter season-the waiting for payment can be trying. I love your episodes and look forward to the next! These are great ideas! I can resonate with a couple that feel very natural and easy. Thanks, Bernadette! Some excellent points in the above blog Bernadette! I will definitely try the technique.